So I was planning on taking the opportunity of a free night to call my old fellow podcasting partner, JA Scott, and tell again what a terrible “Blades of Steel” player he is. However, he has thwarted my plans yet again by his absence, so therefore I’m stuck with you, the unwashed masses, blogging into the bucket of beer. Do you know they used to serve beer in buckets? 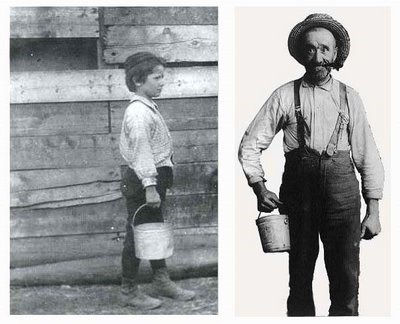 Yep, back ye olden days of the wild west, when you wanted draft beer at home, you’d send your good for nuthin’ son out to the local saloon with your old milk pail and tell him to bring you back some suds, and hopefully not a venereal disease picked up from the local skeezy call girl. Yeah, I know what you are thinking. That’s my boy, Jakob, and his old man in a couple years time. All I gotta say is hopefully for my wife, I look as classy as that guy. Personally, I’m putting my money on making that guy look like the mayor of New York. After a while, people got civilized and started using old milk jugs, and thus the Growler was born. Yup, the growler, life’s little forgotten wonder. It’s like a Grolsch beer except bigger, what with his sealed cap to lock in that freshness in between swigs. My mother in law got me a Game of Thrones branded one which I hope to fill up at the local East End Brewery in downtown Pittsburgh at some point. They have a terrific hefeweizen called Monkey Boy, which is pretty much everything a hipster like myself needs. Anyways, on to the nerd talk for today, with my “Big 4” for the Month of August! Marvel Masterworks and other large collections of issues like this are often the best books to include in these Big 4 reviews, mainly because they are usually a mismatched collection of individual issues with no real common thread. As a result, it’s really hard to write any sort of read pile about them because they shift in tone sometimes so dramatically that you end up just talking about a couple of the previously mentioned single issues that really caught your attention and leaving out huge swaths of the rest of the book. The truth is though this particular Marvel Masterwork is pretty continuous compared to some other ones, which is no surprise given it’s both a Dr. Strange book which was itself born out of Steve Ditko’s need to tell gripping multi issue cosmic yarns and has a long history of doing so, but also these particular issues are written by Roy Thomas, a man that really does love to maintain an internally consistent continuity and attempts to weave common plot points throughout a larger narrative even back in the old Silver age days when that wasn’t as common. This particular trade comes in at the tail end of the first Dr. Strange run, after the book had been somewhat languishing aimlessly for months after Ditko left, but had finally earned it’s own title, not having to split a book with either the Human Torch or Nick Fury. Unfortunately, they didn’t do much to capitalize on that opportunity as despite some wonderful art by Gene Colon (including some truly inspired layouts), the book is largely a rehash of the same stories we saw earlier with the Ditko Run. Strange fights Dormammu in some alternate dimension to free Clea, Strange fights Nightmare, Strange fights a couple evil sorcerers, rinse and repeat. Really, the most original thing thing that happens is the fact that they give Strange a mask, to establish him more within the superhero trope than the mystic outsider he originally was. In fact, some of the better issues of this volume happen after Dr. Strange takes on his masked form, including my personal favorite, his battle against the Juggernaut. As mentioned in a previous blog, old Juggy is one of my absolute favorite Marvel villains, and it’s really interesting to see these two characters come to blows for once, mainly because Jug Head is so often thought of as an X-men villain only that when he fights anyone else, it’s like a breath of fresh air. Plus for the first time we get to explore the more mystic elements of his power set given they come from the Crimson Gem of Cyttorak. The volume concludes with the first chapter of the Undying Ones story line, a sort of Lovecraftian horror adventure which is super important as it’s the catalyst for bringing the Defenders Team of Dr. Strange, Namor, and the Hulk together. I’m actually a pretty big fan of that story and have been for years, so it’s nice that the book ends on a high note of sorts for me, and it actually makes me hungry to pick up my Defenders Volume 1 trade next and reread that awesome collection. Hmmm….future read pile perhaps? As the one token classic rawk album on this list for the year, Hawkwind is again a band I probably should have heard of prior to last year, given that I like Pink Floyd. They are pretty much cut from the same cloth: English, progressive/space rock with heavy instrumentation. I think the reason why I never listened to them though is that Hawkwind really doesn’t have any big hits. As a result, they aren’t heard on your general classic rock stations like Pink Floyd is. Although when you listen you immediately get a Pink Floyd feeling, it seems to be a bit rougher, less polished, which could turn causal listeners off. I personally found out about them by accident in looking for music to listen to while reading the above mentioned Doctor Strange comics. Prog rock is the best for this, and well I fell backwards into this album as a result. I’ve listened to the whole thing several times on Spotify, a particular favorite track being Orgone Accumulator, which has a great driving beat to it. I guess if you’ve listened to it that many times, you should ultimately buy it. And you should too. Show these fellas some love and pick up this album today!! This is my current “working out on the elliptical machine” game. Yes, the secret is out. Where as some read or watch Netflix while working out, my nerdom will not allow such trivial pursuits. When I sweat, I sweat it to the oldies, courtesy of extremely impressive collection of classic games. 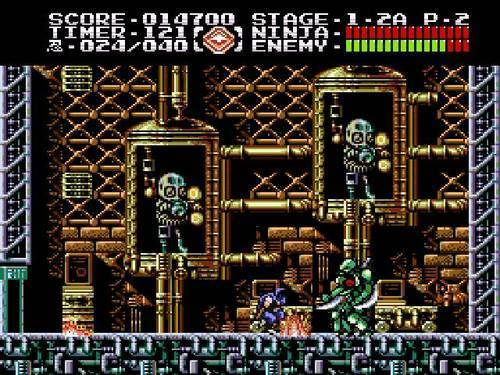 Ninja Gaiden 3 is the only one of the original 3 Tecmo crushers that I have yet to beat, mainly because at the time of its release the NES version was insanely tough and switch over from 8bit to 16bit was already happening. Therefore this game was lost in the shuffle as a forgotten gem. Maybe not as brilliant of a gem like NG1 and 2, but more in the Topaz region. So far playing it, it’s a damn sure better than those late Mega Man entries like 5 and 6. Of course, I’m also playing the SNES version, because of the better graphics and improvements in terms of difficulty. Yes, its a little known fact that they sort of dumbed the SNES rerelease for players after many cried foul over the North American NES version being actually harder than the Japanese version (which in gaming circles says A LOT). Another little known fact is that this game is supposed to be the middle chapter in the Ninja Gaiden NES trilogy. Yes, Ninja Gaiden 2 is still supposed to the last chapter. Weird that they were released like this, but own well. It’s no more screwed up than the Final Fantasy numbering. Ok, this segment might be dumped for next month’s article and replaced with like “Favorite current TV show” or “Favorite current Hot pocket flavor to throw in the garbage”. Mainly, because unlike years previous, I just don’t see that many movies anymore. Well, except for the comic book related ones that we review on this website and podcast. But I think it’s a cop out to say they are my favorite one of the month when I only see one a month. It’s the favorite because there is nothing else in the running. That being said though, I did recently take my kids to see Teen Titans Go! to the Movies and I gotta say I did enjoy it immensely. Now, I’m not going to rehash the entire movie as my fellow Ghostie, Chad Smith, already did that in a previous article (which you can read if you click here). However, I will say as someone that has never watched the cartoon show or had kids that watched the cartoon show, the movie kept us smiling and laughing the entire time. That says a lot given than my youngest is only 4 years old, and keeping her attention span in a movie theater after she chugged a red slushie is damn near impossible. From Will Arnett’s inspired performance as Deathstroke aka Slade Wilson, with all the hamming around his name invoking fear as an arch enemy (SLADE!!! ), to the battle with Balloon Man and the fart jokes, to the time traveling Big Wheel bikes, even Stan Lee’s cameo everything was fun and breezy, just the kind of movie you want to take your kids to and laugh along with them. I gotta say personally that it was the songs that really did it for me. From the Teen Titans Go! rap to the inspirational 80s upbeat song, to even the harmonizing dub step beat to save Krypton from exploding, I found myself grooving and moving in my seat as did my little ones. Even now, I’m half tempted to find these songs on Youtube or something and shake my fanny a bit. Can’t wait for this movie to come out on video and I’m hoping it will be in time for Christmas. Will make for a great present for the kids and we’ll be definitely sharing this again for a family movie night sometime at the house!